Experienced secondary classroom educator, Kevin Steele, will provide powerful, teacher-friendly strategies for flipping the classroom. Numerous strategies will be presented, specifically geared for teachers in grades 6-12. Kevin will introduce you to what the flipped model is, why it works and how you can start flipping today. All examples and strategies are readily adaptable to all content areas. You will experience a wide range of research-based design strategies as well as the flipped mastery model where students can learn at their own pace. Percipients will also discover low-cost or no-cost ways to ensure that every student has access to the flipped lessons. You'll leave this workshop with a wealth of practical ideas, increased confidence in meeting the needs of all your students and a list of resources that will help you start flipping your classroom the very next day. Once you flip, you may never go back! The "flipped" classroom is based on the idea that students need their teachers to answer questions and provide assistance when they run into difficulty on assignments. 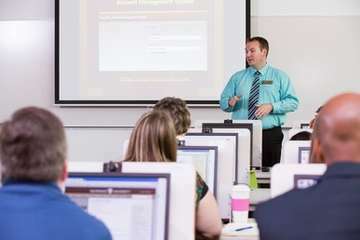 This engaging and practical workshop will offer educators strategies to effectively utilize technology to reach students outside the classroom and create a 24-hour learning community that meets the needs of all learners at any level. 1. Discover Key Components of the Flipped Classroom. 2. Incorporate Powerful Strategies to Differentiate Your Instruction Within a Flipped Learning Environment. 3. Reduce Behavior Issues and Increase Student Understanding of Classroom Content. 4. Meet Your Students on Their Terms and Through Their Media. 5. Utilize Tools to Create Professional and Engaging Multimedia Presentations for Your Students. 6. Ensure 100% Access for ALL of Your Students. 7. Increase Student to Teacher Interaction Time. 8. Utilize Universal Design for Learning Principles (UDL) and Reaching Your Students with Special Learning Needs. 9. Extend and Enrich Your Existing Curriculum. 10. Receive an Extensive Resource Handbook. Kevin Steele is a passionate and experienced classroom teacher who continually keeps students success at the core of his practice. As a technology specialist and classroom teacher, he has been innovative in teaching his students to be collaborative, creative, communicative and critical thinkers with the use of technology. Kevin has been providing professional development opportunities at the local, state and national level for many years. He has utilized the principles of the flipped classroom for several years and has practical experience with the strategic implementation. He is the author of THE FLIPPED CLASSROOM: Cutting-edge, practical strategies to successfully 'flip' your classroom (Grades 6-12), the resource handbook that you will receive at the workshop. The day will begin with Check-In at 8:00am - 8:30am. A light assortment of coffee, water, juices and muffins will be available. The session will begin at 8:30am. Lunch will be on your own for this event. The session will conclude around 3:00pm.